Do you believe in the American dream? I do. My grandfather lived the American dream. He was the son of immigrants, worked his way through college, started his own business, and raised his family on his values of faith, hard work, and generosity. He was truly inspiring. I was so excited to have the opportunity to review a book that promotes the American dream and encourages those same values. Inspiring the American Dream was created by Robert and Kathleen Basmadjian. The Basmadjian’s believe the American dream is in jeopardy and feel the current generation isn’t embracing the values of hard work and the motivation to pursue achievements. Together, they wrote a book to educate children about the American dream and instill values, principles, and virtues to ensure their success in achieving that dream. Abraham’s Journey: A Celebration of the American Dream was written to combat the sense of entitlement of today’s society through reinforcing the values of hard work and personal responsibility. This 30-page paperback book is written for children between the ages of 7-12 and retails for $14.99. The book is about the central character-Abraham who is a young boy living in today’s recession economy. Abraham’s parents have both lost their jobs during the Christmas season and Abraham’s family will be unable to have Christmas gifts. Abraham is saddened by this news and resolves to help save Christmas through working hard to provide gifts for them. As he is using his phone to find jobs he can do, a man shows up on the screen. This man, Abraham Lincoln, takes young Abraham on a journey back through time to meet with some great entrepreneurs of past and some of present time who live the American dream. Abraham then has the opportunity to talk with 6 famous figures. With the guidance of Abraham Lincoln and the discussions with the other entrepreneurs, Abraham discovers a talent for painting and is able to sell a painting and earn money to buy Christmas presents for his family. They story ends with Abraham’s family waking on Christmas morning to a house full presents and Christmas spirit. And being inspired by Abraham’s gift, his family donated blankets, books, and money to a homeless shelter. Abraham was able to realize the American dream. My husband and I read through the book before we read it with our children. The book sparked quite a few discussions between us. Then I read the book with our oldest, Curly, who is 7. She and I read through the book more than once. The first time I explained more about the recession and the historical figures in the story so she could understand the context as we had not yet studied those historical figures or this time period. After the next reading, we had a more indepth discussion about the American dream and our family values as related to the American dream. The story feels jumbled. It quickly jumps from one time period to another and it was hard for Curly to know when the story was back in the present tense and talking about persons who were still alive. It also doesn’t provide much info about the historical figures in the story portion of the book. I had to stop and explain all the historical contexts after every page. Curly was quite confused with the time warp and how quickly new time periods and characters were introduced. The story line puts historical figures together who were not contemporaries of each other. Amelia Earhart was giving Mark Zuckerberg a flying lesson. Curly was frustrated that the figures did not live at the same time and would never have met in real life. Explaining the history in context was difficult. I found it odd to pair two figures from differing time periods together. After the news of his parents’ job loss, Abraham immediately jumps on his smart phone to text his friends looking for jobs. I think if my husband and I were out of work, the luxuries of expensive technology would be one of the first things to go. 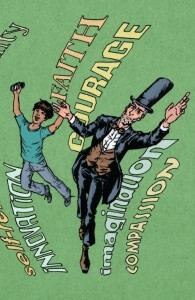 Curly wondered why Abraham had his own cell phone, because at 7, she does not have her own phone. So, reading about Abraham chatting away on his smart phone in light of his current financial circumstances was a little disconcerting to her and to me. While I do believe in the American dream, my perception of that dream does not minimize faith in the equation. Sure the American dream is about independence, self reliance, responsibility, and hard work but there’s still faith, trust, and grace. If I present a book about the American dream, I don’t want it to glorify man’s hard work and emphasize reliance on one’s self alone. Ultimately, we should rely on our Savior who is the only reason for all of our successes. I love reading historical fiction because I love how it effortlessly teaches and draws kids into the story and gives them the thirst to learn more. I was glad the book introduced some noteworthy persons from history and present day. I was pleased that the book introduced worthy values of hard work, charity, and personal responsibility. This are values I want to instill in my children and I love that I can use books and stories to teach and illustrate these values. The back of the book contained further information about the figures presented in the book as well as definitions of the various character qualities and values from the story. This was a great jumping off point for further discussion. Curly enjoyed the story and the pictures overall, I just can’t get over the feeling that it’s missing something. There could be so much more depth and meat added to the story. The story line and conflict was so quickly resolved that Curly wasn’t interested in more than a couple readings of the book. I think it’s a great introduction to the American dream with some historical figures added in, but my kids like more detailed stories with more information included. It was a good starting point for discussions, but we had to take our idea of the American dream much farther in explaining to Curly. My perception of the American dream must be a little different than the authors. In the story, the young boy is inspired to work hard in order to save Christmas and buy presents. My view of the American dream is vastly different. The American dream is not about gifts or holidays or providing the extras for your family. The American dream is about opportunity and success. The American dream is about the freedom to pursue interests, achieve personal goals, and live a life with unlimited possibilities. And while I love the freedoms we have in America which enable us to pursue the American dream, I put my faith in God above my faith in my self and my own abilities. I prefer resources that above all, encourage a trust in our Creator and inspire us toward developing character through Scripture. What did the other Crew members think about Abraham’s Journey? Read more reviews here!